For the third week in a row, our picture comes from the Gulf Coast, which, as you know, was recently ravaged by Hurricane Katrina. We don't get hurricanes here, but we do get serious storms and earthquakes. Remember the 2001 Nisqually quake? We got lucky four years ago. That earthquake was a huge wake up call telling us we need to get ready for a disaster or we'll suffer a fate similiar to what New Orleans has suffered. What you're looking at is a destroyed bridge in Bay St. Louis, Mississippi. It's a view from the air, this picture is courtesy of NOAA. This bridge connects Bay St. Louis and Pass Christian...well, it used to. 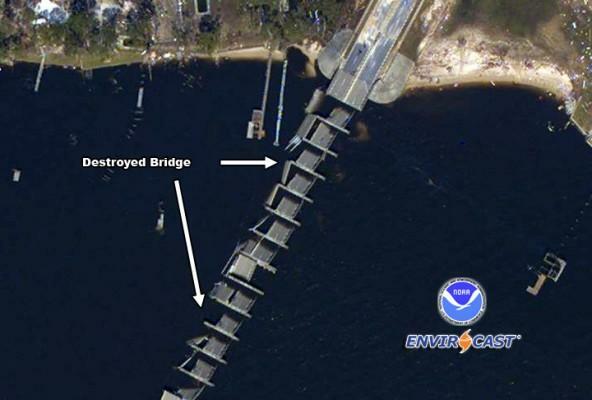 Last week, you saw a picture of a collapsed U.S. Highway 90 bridge near Biloxi. The week before, you saw the destruction of New Orleans' Twin Span, Interstate 10, over Lake Pontchartrain. This week, we're showing you yet another damaged structure. KING 5 did a poll yesterday on Initiative 912. The results of the poll indicate once again that we can win Initiative 912. Winning is within our reach, but only if we campaign hard. 1. If the election were today, would you vote yes on Initiative 912 or would you vote no? 2. Do you believe the State of Washington will spend the money from the gas tax responsibly? 3. How does the recent rise in gas prices affect your opinion of a nine-and-a-half cent gas-tax increase? Does it make you more likely to support the tax? Or less likely? 4. Do you feel the projects funded by the gas tax are fairly distributed between the Puget Sound area and the rest of the state? 5. Do you believe the state right now is spending enough money on transportation? 6. Has the failure of some public infrastructure in Hurricane Katrina made you more likely or less likely to support a gas tax for transportation projects here? Also see Stephanie Bowman's column on Initiative 912 in the Seattle P-I yesterday, a great op-ed. Also, numbers came in for Initiative 900 - surprisingly showing voters are opposed to Eyman's latest initiative. The Permanent Defense Journal has the details. The danger is real. The threat is real. When our big earthquake hits, multiple structures will fail. It won't be just the viaduct and the 520 floating bridge. It won't just be Seattle, either. We need to get ready. We need to fund improvements to our transportation infrastructure. We've waited too long. Vote no on Initiative 912 and support a decision to invest in the future of our state.